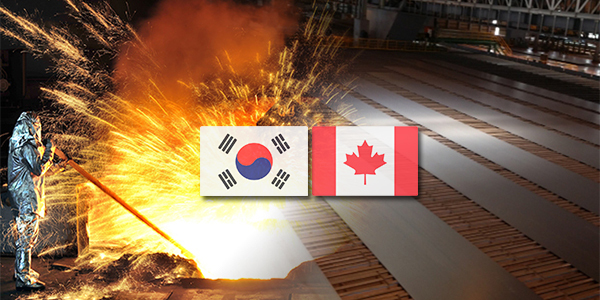 Canada removed South Korea from potential steel safeguard target upon finding its produces “are not a principal cause of threat of serious injury” to the local industry. The Ministry of Trade, Industry and Energy said on Thursday that the Canadian International Trade Tribunal (CITT) excluded Korea from its list of countries where tariffs have been recommended to be imposed on heavy plate and stainless steel wire as imports from Korea do not cause serious harm to the industry. The statement comes after the Canadian government in October, last year, initiated an inquiry on the importation of certain steel goods as it judged special tariffs, or safeguards, were necessary to protect local steel producers from a surge in imports after the United States’ Section 232 tariffs on steel and aluminum and European Union’s safeguard measures on steel products. The inquiry began into seven classes of steel goods – heavy plate, concrete reinforcing bar, energy tubular products, hot-rolled sheet, pre-painted steel, stainless steel wire, and wire rod – and Canada charged a 25 percent tariff since October 25. The CITT, however, said Wednesday that special tariffs should be lifted on five of the 7 steel products as a rise in imports do not cause serious harm to the local industry but should stay on two others – stainless steel wire and heavy plate. It recommended that safeguard measures continue to be applied to two types of steel goods, except for those originating in certain free trade agreement partners including Korea. The Canadian government, meanwhile, plans to confirm final measures before May 12 when current 25 percent tariffs come to an end after discussions with related countries based on the latest CITT recommendation. Once approved, the 25 percent safeguard tariff on Korean steel goods will terminate next month.